The next few posts feature Asa Hickok, my great-great-great grandfather at the beginning of the Revolutionary War. The information is taken from the Revolutionary War section in my upcoming book, Abby, Laurilla, and Mary Ann. Asa Hickok, his wife Esther Hinman, and their children (including Hannah Hickok who later married James Eldred) were the first of my ancestors to arrive in Lumberland, New York. In Asa’s request for a Revolutionary War Pension, he wrote that the family moved from Connecticut to Lumberland in 1812. I was almost twenty-one when I entered the service under Colonel Benjamin Hinman of Woodbury, Captain David Hinman, and Lieutenant Benjamin Hungerford. It was around the first day of April 1775.—Asa Hickok. Amos Doolittle, Plate I, The Battle of Lexington, April 19, 1775. One of four engravings in the set, 1775. Gift of Mrs. Rufus W. Bunnell and Miss Cordelia Sterling in memory of their brother, John Sterling. Yale University Art Gallery, 1920.25a; 2482. Public domain. On April 19, 1775 the British and Americans clashed at Lexington and Concord, in Massachusetts. 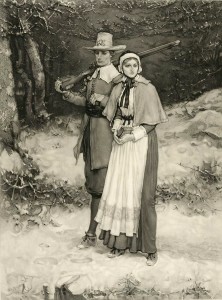 Local militias which had begun when the English first settled the New World, were soon on their way to help in Massachusetts as the Continental Congress had promised. Woodbury was western Connecticut’s recruiting headquarters during the entire war. 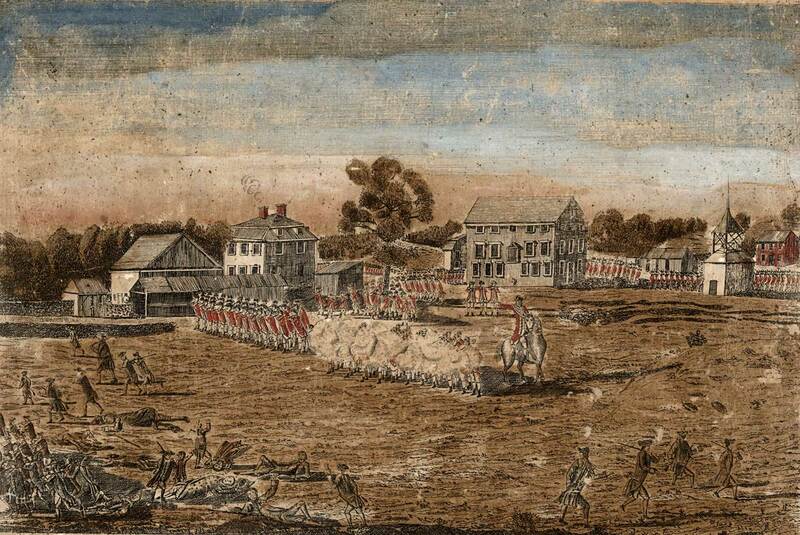 Since the principal route of the Continental Army from Boston to western posts passed through Woodbury, the town became a prominent point for the collection of supplies. Woodbury’s Truman Hinman and Shadrach Osborn, assistant commissary of purchase and an issuing commissary in Woodbury from May 1777–February 1781, were in charge. Provisions were issued to many marching parties and troops in winter quarters. 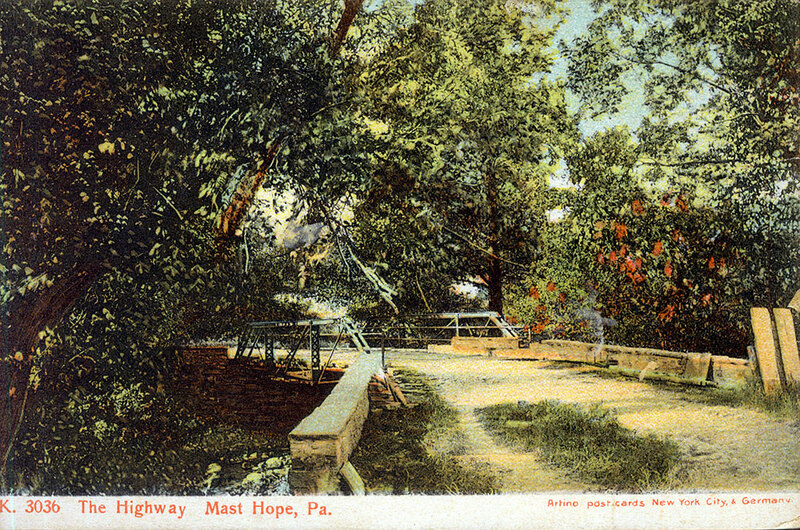 “The Highway Mast Hope, PA.” Postcard in the Austin Family. This was first posted in April 2015. In the early 1800s, there were only two roads to the Town of Lumberland—the Sackett Road and the Newburgh-Cochecton Turnpike. Neither of them, perhaps, deserved to be identified as roads. The Newburgh and Cochecton Turnpike was a 70-mile plank road. 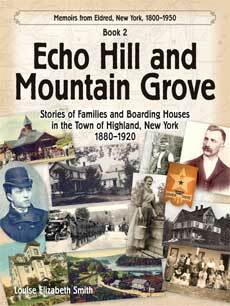 It started at Newburgh on the Hudson River, and went west to Cochecton, on the Delaware River. Newburgh became a trade center to get supplies to and from New York City. So many settlers traveled to the new area that in 1809, Sullivan County was split out of Ulster County (one of the original twelve New York Counties). At the same time, Bethel, which had been part of the Town of Lumberland, became its own Town (township), and included the villages of Cochecton and Delaware. Later, there were other roads to or through the Town of Lumberland. James Eldred worked on the Mast Hope Turnpike, which started near Middletown, went through Forestburg, and crossed through the Town of Lumberland on its way to Mast Hope, Pennsylvania. In 1815, work was started on the Mount Hope-Lumberland Turnpike, which went from Orange County to Narrowsburgh, New York, and later to Honesdale, Pennsylvania. George D. Wickham, Benjamin Dodge, John Duer, Benjamin Woodward, Benjamin B. Newkirk, William A. and Abraham Cuddeback were the directors of the Mount Hope-Lumberland Turnpike, segments of which are still in use today.—The Mill on Halfway Brook, p. 8. 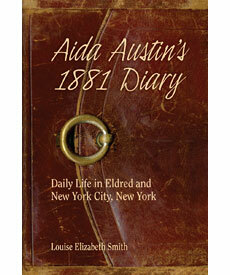 These are the March entries in Aida Austin’s 1881 Diary. 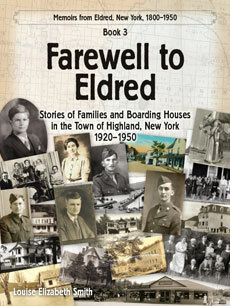 Aida was staying with her Eldred-Austin cousins in NYC. She turned twenty in November. The door bell has rung about fifty times I guess today. Tired, tired, tired. Arch stopped in this morning just about noon with Nettie, Buddie, and Ida. I took Gussie and Tom around to Net’s this afternoon. Not a very bad beginning for Monday. I took the children to Wood’s this morning to get their pictures, but I did not get them. Doctor Lang came this afternoon and vaccinated Harry again. Net, Lil, and the baby came around to dinner today. I went out this afternoon and took Little Archie out for a walk. Rained all day. Ad went around to Net’s to dinner and stayed all the afternoon. Gussie went up to his Grandma’s, so I brought Tommy up in the parlor and practiced. I am getting so nervous I am almost afraid to go to bed. It seems I should wake up if I went to sleep. I will see Dr. DeVenoge next week. Rand brought little Ida down to Aunt Maria’s this afternoon and has left her down all night. Maria was over this afternoon. Her cold seems to be better. She had a letter from Mother and Dora. Ad has been a bed nearly all day. She has such a terrible cold. Ida is going to a ball with Arch and Rand tonight. Little Ida has been down here all the afternoon. Buddie is around to Net’s and she has been around two or three times. I have been copying all my papers in a book. They are such a nuisance. I have not studied. After tea, Harry and I went out. I stopped to see Dr. Lang. He says it is my heart, that I am nervous. He gave me a bottle of medicine. I think that medicine is helping me. I feel better. Sewed a little, drew pictures, and that is about all. Cousin Mort stopped in for his clothes tonight and had a game or two of checkers with Cousin Ida. I went to see Dr. Lang. He changed my medicine. I have felt a great deal better today. Maria was over this afternoon. Ad has been out again. Aunt Maria and Ida went up to Rand’s. I have not felt very good today. I am afraid his medicine is not helping much after all. Cousin Mort stopped in this morning to bid us good bye. He is going away tomorrow. A flat, barge-like rope ferry crossing a narrow point on the Schuylkill River near Philadelphia, Pennsylvania. Artist: James Fuller Queen, 1856. LOC: 2016648663. 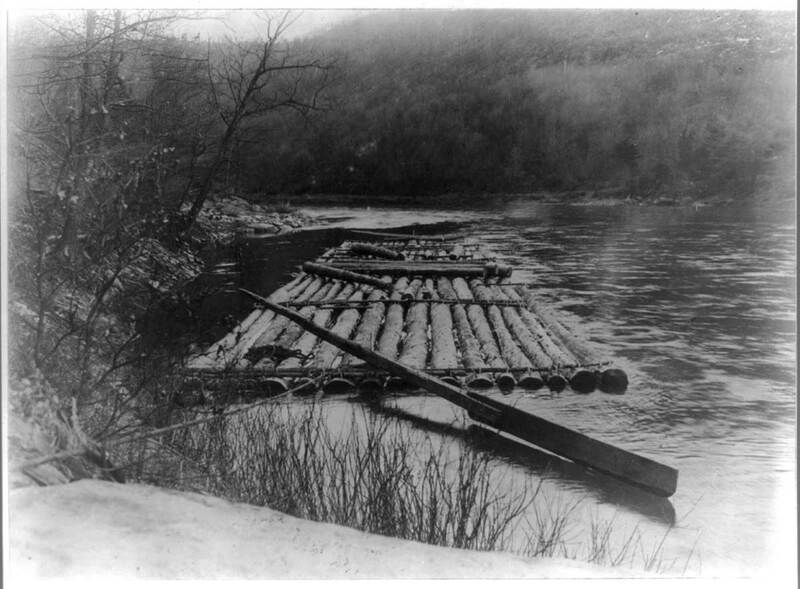 Log raft on West branch of Susquehanna River. Photograph 189? LOC: 2016650769. It’s hard to believe this Halfway Brook blog will be ten years old in September. Here is a post from 2009, with an image I recently found on Library of Congress. In 1800, Lumberland (then two years old), had a population of 733, most of whom had lumber-related jobs. Saw-mills operated on various streams. 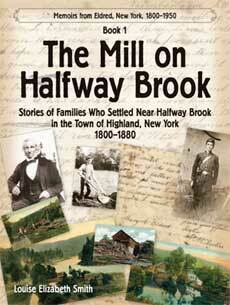 Halfway Brook was said to have had ten sawmills on its nine miles. Enormous amounts of lumber were made into rafts and floated down one of the many rivers or brooks in the area that fed into the Delaware River. 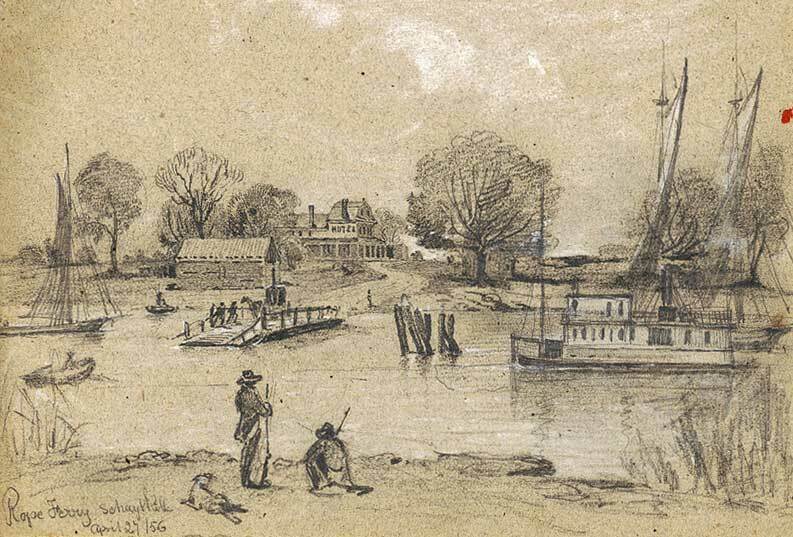 The Delaware River flowed to Carpenter’s Point (Port Jervis) and on south to Philadelphia, Pennsylvania, where the lumber could be sold. It was around 1764, the year after the French and Indian War, when Daniel Skinner made a 15 foot by 80 foot raft from six felled pine trees. Daniel ingeniously lashed these logs (masts for boats), together, added a rudder, and floated the raft down the river—Timber Rafting it was called. Leaving Cushetunk/Cochecton where he lived, Daniel and two others (one drowned) rafted about 200 miles down the Delaware River, past the settlements at Narrowsburgh, Ten Mile River, Shohola and the River, Pond Eddy, Mongaup, and Carpenter’s Point, and headed southeast to Philadelphia, Pennsylvania, where Mr. Skinner was paid twenty-four pounds—four pounds per mast. A Home in the Wilderness. 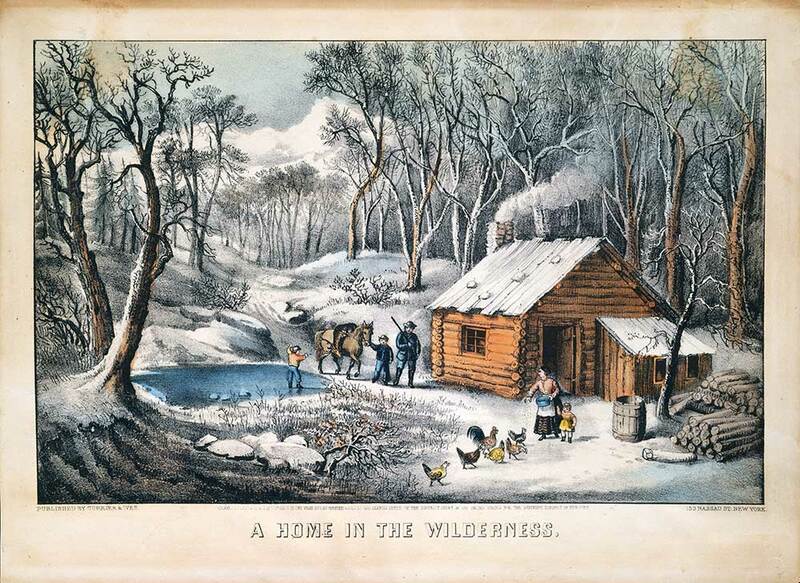 Colored lithograph; Currier & Ives, 1870. Bequest of Adele S. Colgate, 1962. Accession Number: 63.550.204. Public Domain. Terrible cold* blanketed the Northern Hemisphere with wintry weather in the summer of 1816. The notorious cold destroyed most of the crops in the Town of Lumberland, New York. Only rye, potatoes, and onions grew. Not even a blade of corn sprouted. Asa Hickok, his sons Reuben, David, and Justus, and other Lumberland farmers, dressed in their heaviest clothing, cradled, raked, and bound their rye crop in their deer skin mittens. In 1816, Lumberland, New York was the proud owner of some 150,000 acres of rolling hills carpeted with huge ancient trees, interspersed with streams and ponds. Lumbering was the main occupation of its few residents. Halfway Brook flowed south through the middle of Lumberland to the Delaware River, the town’s southwestern boundary and the New York-Pennsylvania border. Though Lumberland had been completely stripped of its entire white pine trees, the area was still heavily forested with yellow pine, hemlock, oak, hickory, and other trees. Some were two hundred years old. Nine sawmills dotted Halfway Brook’s nine miles. There were sawmills on at least four other streams which also fed into the Delaware River. The Asa Hickok family had lived in the area for four years and at least had an established garden. Their Homestead with its house and barn sat near Halfway Brook, two miles north of the Delaware River. A falls on a stream now called Hickok Brook, connected with Halfway Brook on its way south to the Delaware River. Near the juncture of Halfway Brook and the Delaware River was the River, a hamlet later called Barryville. A crude, rope-guided ferry was the only way to cross the Delaware River from Barryville south to Shohola, Pennsylvania. James Eldred, his wife Polly, five children, and his twice-widowed mother had recently arrived—two days before 1816 and ten days before Phebe Maria Eldred was born. Though 1816 was a terrible year to start a garden, James Eldred at least had one of the nine sawmills on Halfway Brook. The mill sat beside their old log cabin home, four miles north of the Delaware River. 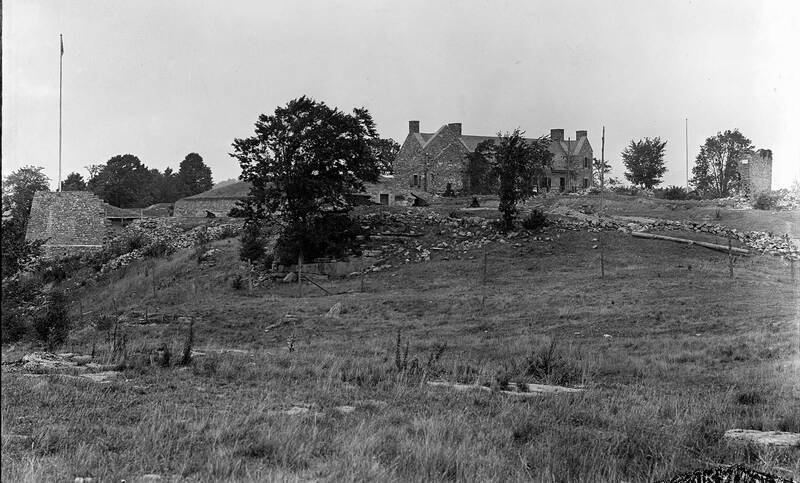 Their property, on two cleared acres near the middle of Halfway Brook, was the southeast corner of the future Halfway Brook Village—much later renamed Eldred. In 1816 Lumberland was sparsely settled. Bears, wolves, foxes, coyotes, and wild cats hunted in the thickly forested area, and occasionally helped themselves to the settlers’ chickens and sheep. There were only four frame houses, nine frame barns, and a gristmill. The animals included 19 horses, 34 oxen, and 34 cows. There were ten wagons. One person owned a clock which furnished the time for the town. James Eldred owned one of three watches. A Congregational Church met in log cabins or barns in remote areas near the Delaware River, in Lumberland. In the fall of 1814 some of the meetings were held at the Hickok Farm. In 1815 Sylvia Hickok, daughter of Asa and Esther, died at the age of 34. Sylvia was buried in what is now the Old Eldred Cemetery. • The cold summer is now thought to have been a result of the volcanic eruption of Mount Tambora in the Dutch East Indies in 1815. 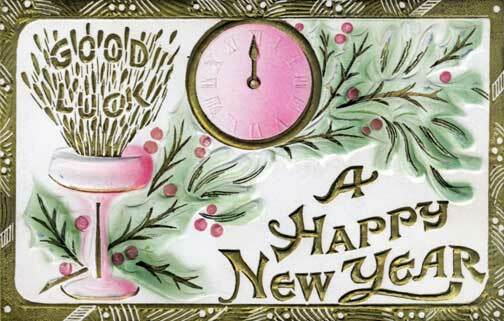 This is a repost of a collection of Austin New Year’s Postcards first on the Halfway Brook site starting in 2011. Postcard sent to Elizabeth Austin in 1913. 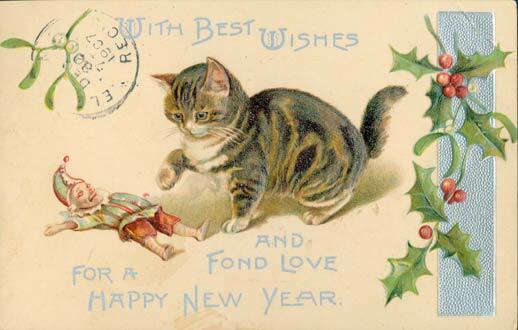 1914 New Year card in the Austin Collection. 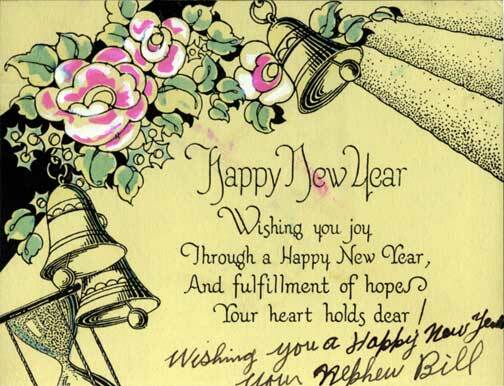 1931 Happy New Year from Bill Austin to his uncle Ell Austin. 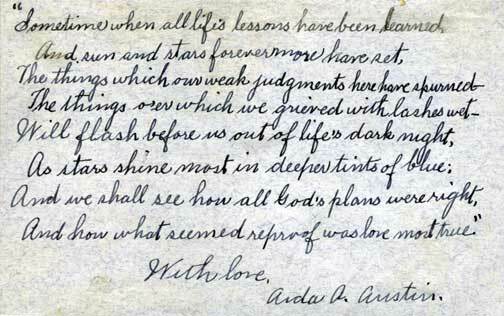 In 1937 Aida Austin sent this card to her brother Ell Austin. 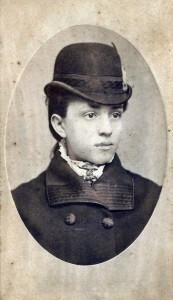 On the back she wrote the first verse of a poem by Sallie Ward Barns (1836–1919). Poem on back of Aida’s 1937 New Year’s card. 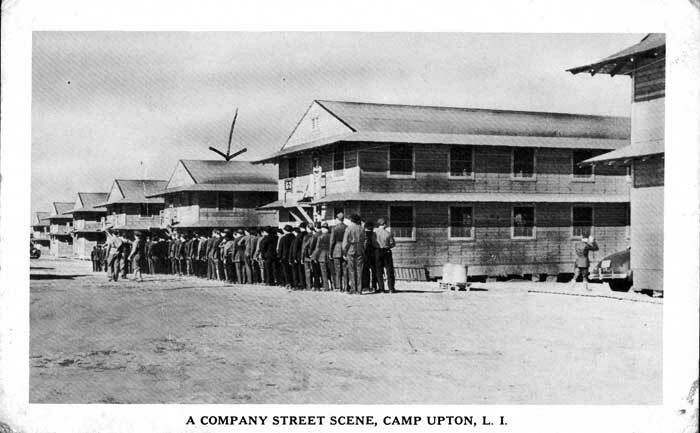 Art would enlist at Camp Upton in February 1942. Postcard from Art Austin to his uncle Lon Austin in Eldred. December 1941 is the only month I have not posted. Here are the links to the previous months of 1941. Monday morning, December 1, Aida went to the A&P. The weather was very cold and it felt like snow. Lon and Arthur went to church in Barryville. Wednesday morning, on his day off, Arthur visited his aunt and uncle. It was much colder on Friday when Jim started work again for Narrowsburg Lumber Company. Tuesday morning in Eldred, Aida went to the A&P and then to see Ed Myers, where her Austin nieces stayed. Wednesday in Islip Aunt Anna worked on guest towels for Christmas gifts. Anthony Hirsch stayed there during the week. Thursday Chef Anthony made a duck dinner for Anna’s guests. “A good time,” Anna jotted down in her diary. Thursday Katherine Dunlap called on Ella on the west side of Eldred. Stella was in for a while. 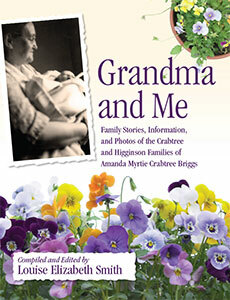 “Hitler and Italy declared war on the U.S.A.,” Ella wrote that night. The Austin and Leavenworth aunts and uncles would be quite concerned during the next several years as Art, Bill, and Bob Austin and Jim Leavenworth would eventually serve overseas. At the end of the year Charlee took lessons at the Singer Machine Company. With the U.S. now in a war, the townsfolk took turns watching for planes at the golf course on what was once Dr. DeVenoge’s property. Jim and Goldie watched for planes on Friday. Sunday afternoon, December 21, Arthur was up to Aida’s for his skates. The Methodist had their Christmas Tree in the evening. Tuesday morning Aida went to Mae’s and the A&P. Martin Myers drove her home. At noon on Christmas Eve, Mae stopped by Aida’s with some candy and cake. Mezzotint of a Puritan husband and wife walking through snow on their way to Meeting. He carries a rifle, she a Bible. Engraver: Thomas Gold Appleton; Artist: George Henry Boughton; 1884/1885. Library of Congress Prints and Photographs Division: 00038. Hannah Hickok Smith was 79 years old when she wrote the following about Thanksgiving in the year 1846. Hannah, a widow for sometime, and her five daughters, Zephina, Laurilla, Cyrinthia, Julia, and Abby lived in Glastenbury, Connecticut, some seven miles from Hartford. A voracious reader, Hannah’s eyes were weakening and she repeatedly mislaid her glasses. She commented on her health as she often did not feel well. …It has grown so cold today that all our cattle are in the yard eating stack hay. I do nothing but read…We washed and ironed. It is near Thanksgiving, but we do not begin to cook for it. I do not think I have been so happy on that day as I was before my father’s death (1784) when I was sixteen and Bella and Sally came to see me. Next day after tomorrow is Thanksgiving. Zephina and Laurilla have been down the street to get a sheet iron to bake on and a stove pipe fixed for the parlor. Zephina is gone to kill fowls. Today rose about seven…The storm begins to be tedious. Our cattle should go in the stable…I am as well as usual and better…It does not seem like Thanksgiving tomorrow. We have had a fire here in the air stove today. Laurilla and I are pleased with it. It makes such equal heat. I think it made the pudding the best we ever had. And because it was so sweet, the tart and pumpkin pies. We have all our cattle stabled, except the 2 yearlings. Thermometer: 30. The wind blows and it will be colder. Some sleighs, but poor sleighing, though the snow has not melted. Note: Mezzotint is a printmaking process which enables half-tones to be produced by roughening the plate with thousands of little dots made by a metal tool with small teeth, called a “rocker.” In printing, the tiny pits in the plate hold the ink when the face of the plate is wiped clean. A high level of quality and richness in the print can be achieved.